Hello again to all our customers and friends, old and new, as the 2019 season begins to unfold. Thank you too for taking the time to read my newsletter and as always, thank you for the kind comments made by lots of you too; your feedback and comments are very much appreciated and help to define us as a business. 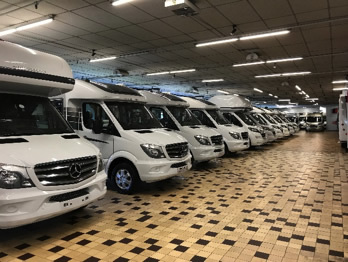 My aim, as always, is to offer an over-view of Derby Motorhomes with updates specific to us, Auto-Sleepers and the motorhome industry as a whole. So, I’ve asked before and will continue to do so, if there is a particular subject or topic that any of you would really like me to touch-on, please contact me, you never know, if it’s a subject that I know a little about and it’s appropriate, then I would be happy to include it in future updates and features. One thing I really would like to do this year is start a page or section, possibly initially updated every couple of months or so, that contains contributions written by you; my idea is to have an interesting news page that has stories and photographs written and contributed by you, our customers. These may well be interesting journeys, problems encountered, fabulous camp-sites, interesting stops, anything in fact – send in something and we’ll see but I would love to read your stories and see your photo’s; I’m sure others would too! Well, yet again, this month I know exactly where to begin – it’s the NEC February show. I can’t believe any us don’t know that it’s that time of year again. For our part we will be staffing the Auto-Sleepers stand as usual and looking forward to meeting friends old and new yet again. The show runs from Tuesday 19th February and ends on Sunday 24th February and although this month’s show isn’t as large as October’s, I’m sure there will be lots of visitors and plenty of business completed. 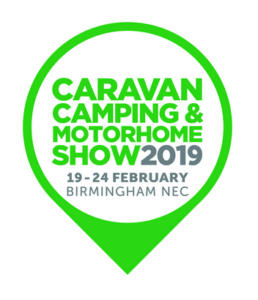 This year, the show will be opened by TV presenter and president of The Camping and Caravanning Club, Julia Bradbury, while there will also be appearances from TV presenter, journalist and Caravan and Motorhome Club member, Matt Allwright and ITV1’s Love Your Garden co-presenter Martin Dorey. There will also be appearances throughout the week from a host of other well-known celebrity guests. I will be on the Auto-Sleepers stand at the NEC all week as will Richard Holness and for the first time, Mike Smith too. Mike is new to us and Auto-Sleepers having spent the last 27 years in sales with Ford; a well-known car-supermarket and BMW too but finally, as a Broadway owner himself, Mike simply couldn’t resist the lure of the leisure industry! 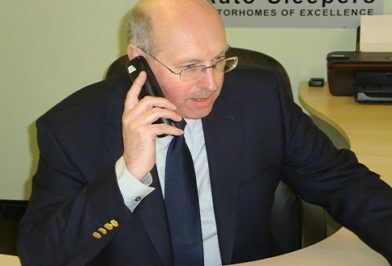 Mike really understands motor homers and more importantly, what really makes us all “tick”; he’s recently back from taking a year out, touring Europe in his Broadway EL Duo so, please come and find him and get to know our latest salesman. Sadly, the Newark show is not going ahead this year; Moretons, the show organiser, have withdrawn from promoting this type of event so this year we are going to miss out on a show that we really loved doing, even in the dreadful snow that we experienced last year! As was the case every year, the Newark show took place twice a year; an early outdoors show during March and then a second event in early September. As some of you will remember, last year’s show was marred by the visit of the “Beast from the East” which sadly struck a knock-out blow! 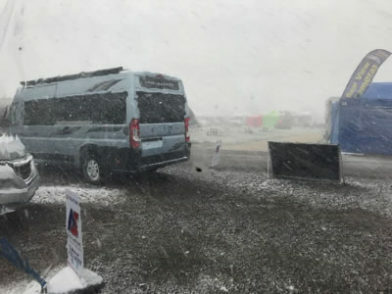 And, having spent 2 very long and challenging days setting up for the event, Saturday brought the challenge of near gale-force winds with heavy snow causing “white-out” blizzards several times. The organisers were forced, for safety reasons, to close the event. On a more personal note, the loss of this event means that I shall be forced to wait until April at the Peterborough show to meet up with my old friend and customer, Mel Smith who, I sincerely hope, will be making another of his now legendary, “special fruit cakes” (laced with alcohol) to warm us all up – looking forward to catching up with you again Mel! 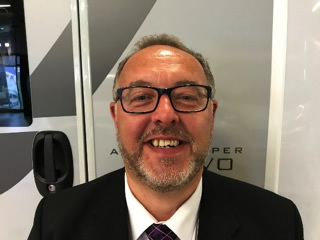 On a more somber note, I would like to reassure everyone that Brexit will have no major effect to us or Auto-Sleepers – the factory have planned, for several months and have plenty of chassis stock and parts and we, as a dealer, have lots of chassis stock orders placed with the factory too, so should the worst happen, no one should miss-out due to Brexit! 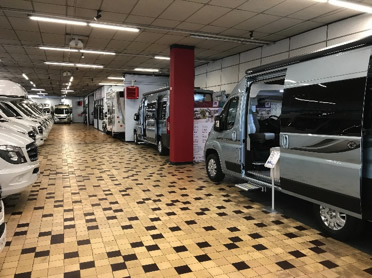 For those of you reading about Derby Motorhomes for the first time and may not be familiar with us, we aim to have a complete display of each new Auto-Sleepers model produced, in our indoor showroom, at all times. There will possibly always be an exception, for reasons beyond our control or operational reasons but we find that potential customers prefer to travel to visit us as our showroom and dealership in general is a friendly place to be. Unlike the larger shows which can be very busy and for some quite intimidating, all of our staff are friendly, helpful and very knowledgeable. Finally, a reminder about our “Refer a Friend or Relative” scheme. This has been running for about a year now and has proved very popular so, if anyone has friends or family members thinking about a change of motorhome or looking for the first time, please remember that we have a referral scheme in place. So, if you would like to earn some free Marks and Spencer shopping vouchers, please ask for our referral vouchers if you don’t already have them. Simply fill your details in, pass them on to your friend or family member and once they have placed their order and collected their new motorhome, hey-presto! £100 worth of Marks and Spencer vouchers are yours! Please have a look at our website for more information. A big thank you to all our customers and friends (as we like to think of you). Without your support our business would be meaningless. We really do appreciate your continued trust and support – your messages are most welcome as are the cakes and other “treats” that so many of you continue to bring in to the dealership; we really are so very lucky to have such lovely customers. Thank you for taking the time to read my latest newsletter and as always, I look forward to meeting you all again very soon.